Tokyo Tokyo consistently fulfills its promise of bringing a taste of Japan closer to many Filipinos by giving customers more value for their money with high quality food at a reasonable price. 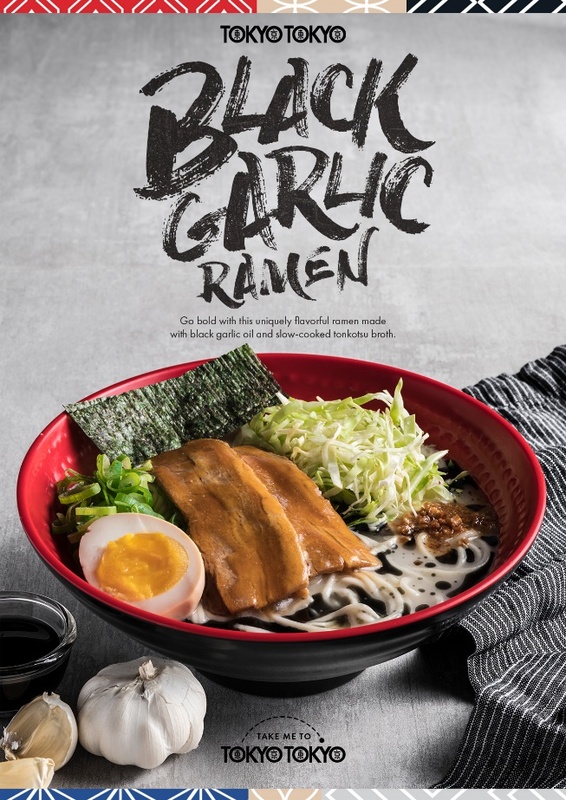 This time, Tokyo Tokyo is introducing a new flavor of ramen to entice the ever-changing Filipino palate, The Black Garlic Ramen. With a bold new take on a classic fan favorite, this exciting play on a well-loved dish will certainly warm you up and will instantly grab your attention with its unique look. The Black Garlic Ramen utilizes an innovative element – the black garlic oil – which gives the dish its color and strong garlic flavor that will hit the spot when the rain comes pouring down. The ramen also includes premium quality ingredients such as freshly made ramen noodles, a generous variety of ramen toppings that include sliced pork chashu, nitamago egg, rayo oil, nori, and onion leeks. All this will be accompanied by a tonkotsu broth that was slowly cooked for 24 hours. During this rainy season, Tokyo Tokyo will be having a Ramen Weather promo which reduces the prices of all their ramen bowls! This presents you the perfect opportunity to try out the all-new Black Garlic Ramen bowl! Make sure to check the weather forecast or the Tokyo Tokyo Facebook page for updates of the Ramen Weather promo when it starts to pour! You surely don’t want to miss this! Visit https://www.tokyotokyo.com.ph/ for more information about the promo and follow Tokyo Tokyo Philippines on Facebook and @tokyotokyophilippines on Instagram. Cast Your Choice and Win PHP 10,000!